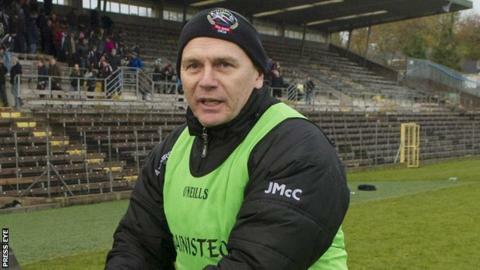 Kilcoo manager Jim McCorry has been named as James McCartan's successor as Down boss on a three-year term. McCorry has transformed Kilcoo's fortunes in recent years and guided the club to the 2012 Ulster SFC final, where they lost to Crossmaglen. The Lurgan native led the club to an Ulster SFC quarter-final win over Cross last year, before suffering defeat at the hands of Ballinderry Shamrocks. McCartan quit two weeks after an All-Ireland qualifier defeat by Kildare. He had taken the Mourne county to the All-Ireland final in 2010 in his first season in charge. Down were beaten in a replay by Tyrone in this year's Ulster SFC preliminary round and made their All-Ireland exit in the second round of qualifiers. Former Armagh captain McCorry led Kilcoo to back-to-back Frank O'Hare Cups and also lifted the Down SFC title in 2009. His side will face Mayobridge in the semi-finals of this year's Down SFC. Crossmaglen Rangers duo Tony McEntee and Gareth O'Neill were also understood to be in the running to take over the reins with Down.